My whitening journey with Albion Exage White + Redeem free trial kit & vouchers! - . My whitening journey with Albion Exage White + Redeem free trial kit & vouchers! boyfriend brought me to a skin specialist. Japan cause I firmly believe that one cannot go wrong with Japanese products! signature Skin Conditioner and it’s been amazing so far that I have to share it with you guys! We all know how tough whitening is, and dread the long and “painful” journey. steps religously for the last 7 days and my skin have significantly become fairer and smoother. clearly see how dull my skin looks especially around the eyes and nose area. So put on your seat belt and get ready to experience Albion Exage White with me! My skin feeling soft and silky smooth from just 1 wash! pictures are improved by Exage Pure Mild Wash! For those who prefer cleansing oil, here’s White Bright Cleansing Oil for you! with water. It also carries a fresh floral scent which I really like! Makes your skin smell sooo good! Look how clean it is after just one wash! Exage Moist Crystal Milk is meant to be used right after cleansing, with a cotton pad! Do not be lazy and start using your hand/ fingers ok? I look forward to this step every day and night by the way! 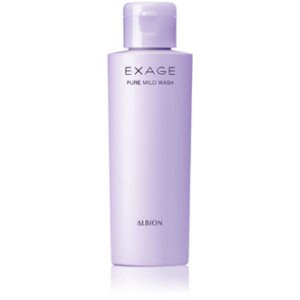 Albion Exage White White Clearness Lotion II a moisturizer to be used after step 3. My complexion is a lot brighter and with a natural glow! used. And trust me, I’ve tried a-lot of other whitening products! hardworking and follow these steps daily – religiously. For advertorial, email me at reieek1@gmail.com.